If you flew over Pensacola Bay, you would see that it has many natural forms of protection. Sandy barrier islands defend the narrow entrance into the bay and rolling hills provide excellent vantage points to watch ships arrive. The many colonial European groups who settled near Pensacola Bay understood the benefits of this natural landscape. To bolster the area's natural protection, both the Spanish and the British built a series of fortifications between 1698 and 1781. Colonists constructed most of these defenses near the water as ships posed the greatest threat to their settlements. 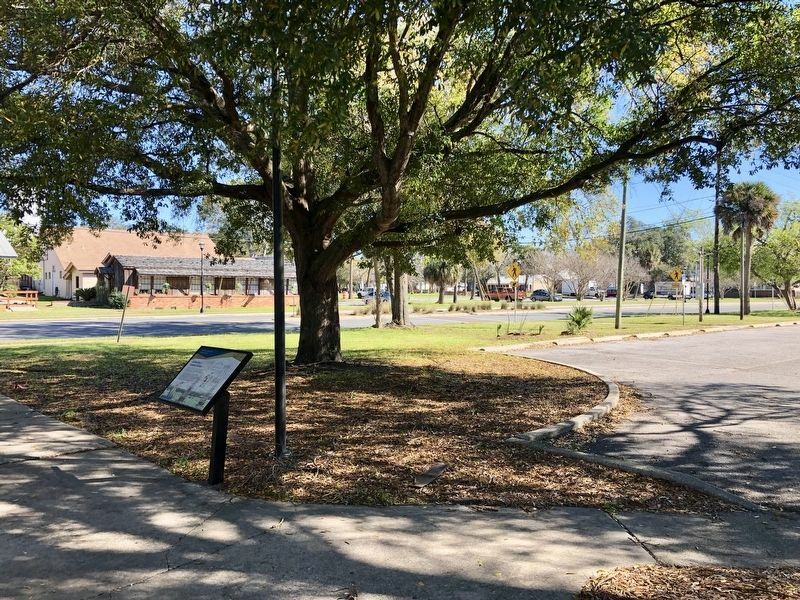 The most prominent of these fortifications was located in downtown Pensacola, between what is now, Seville Square and Plaza Ferdinand. 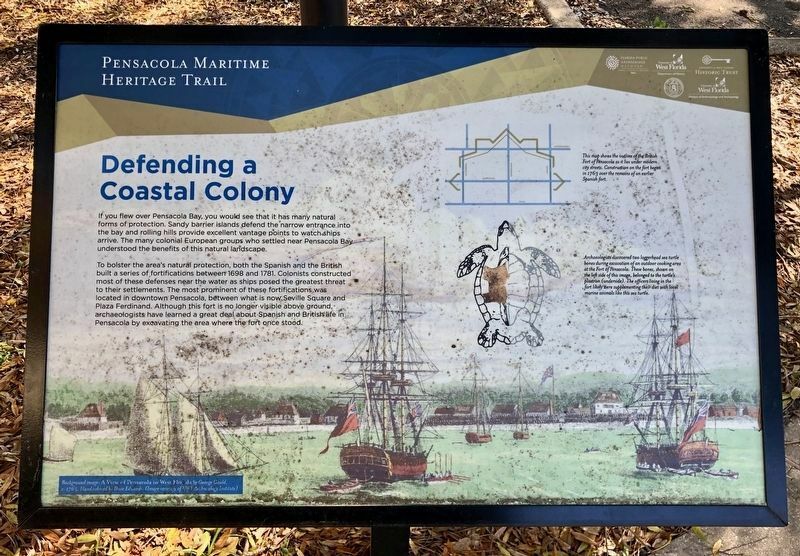 Although this fort is no longer visible above ground, archaeologists have learned a great deal about Spanish and British life in Pensacola by excavating the area where the fort once stood. 2. 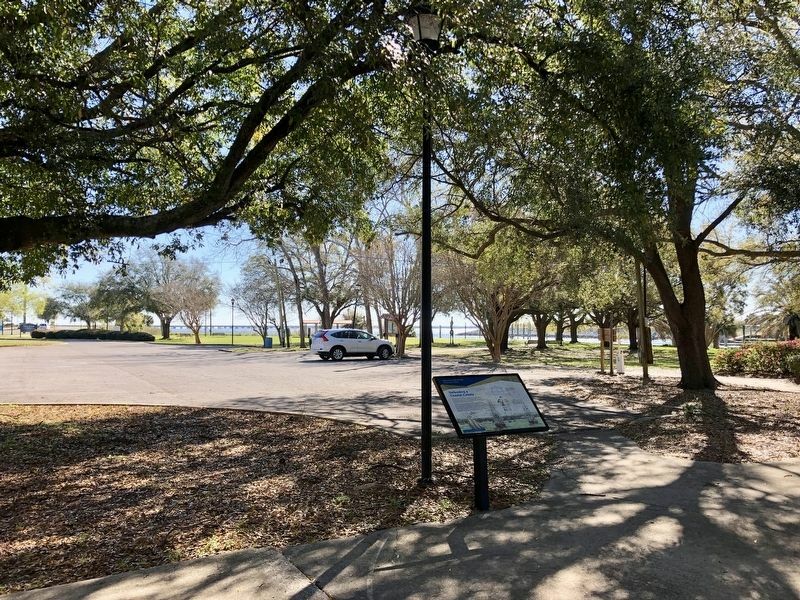 View from marker through Bartram Park to Pensacola Bay. of the British Fort of Pensacola as it lies under modern city streets. Construction on the fort began in 1763 over the remains of an earlier Spanish fort. Middle right: Archaeologists discovered two loggerhead sea turtle bones during excavation of an outdoor cooking area at the Fort of Pensacola. These bones, shown on the left side of this image, belonged to the turtles plastron (underside). The officers living in the fort likely were supplementing their diet with local marine animals like this sea turtle. Location. 30° 24.483′ N, 87° 12.621′ W. Marker is in Pensacola, Florida, in Escambia County. Marker can be reached from East Main Street east of South Barracks Street, on the right when traveling east. Touch for map. On the East end of the Destination Archaeology Resource Center. Marker is at or near this postal address: 207 East Main Street, Pensacola FL 32502, United States of America. Touch for directions. 3. View east on Main Street. of this marker); William Bartram Trail (within shouting distance of this marker); Supremacy, Siege and the Sea (about 300 feet away, measured in a direct line); Christ Church (about 400 feet away); Firefighter Vista S. Lowe (about 500 feet away); John Wesley Hardin (about 600 feet away). Touch for a list and map of all markers in Pensacola. More. Search the internet for Defending a Coastal Colony. Credits. This page was last revised on March 7, 2019. This page originally submitted on March 7, 2019, by Mark Hilton of Montgomery, Alabama. This page has been viewed 42 times since then. Photos: 1, 2, 3. submitted on March 7, 2019, by Mark Hilton of Montgomery, Alabama.